Here it is! The Handyman Husband project I promised! 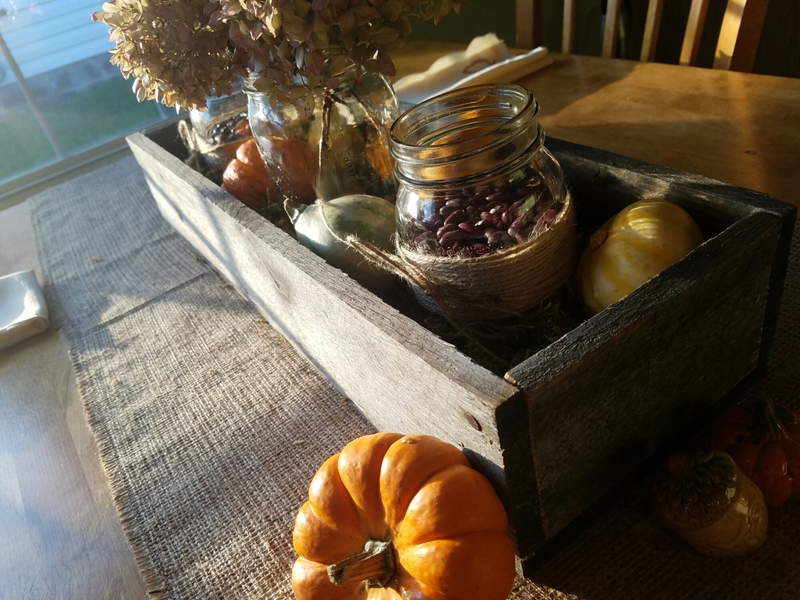 Again, due to my Pinterest browsing, I had a brilliant idea to make a rugged wooden box for my fall centerpiece. Thankfully, I have had a pallet hanging around in my backyard for a few years now, which has left it beautifully weathered and begging to be repurposed. And, unfortunately, it also means that the wood is very hard and the nails are stuck fast. So dismantling it was a little bit fun. My dear husband had to use his sawzall to cut through the nails. But, as with most pallet projects, dismantling was the first step to our project. Next, we measured how big we wanted the box to be. I wanted to be able to fit some Mason jars as well as a few other decorative pieces in the box, so we decided to make it 2 slats wide (this particular pallet had pretty skinny slats-3.5″). We measured and cut to size (four 20″ boards, two 5.5″ boards). Next we assembled it. In order to avoid showing shiny nails or screws on my beautifully weathered wood (and because we didn’t have any wood glue or clamps), we used my husband’s air hammer and these teeny tiny nails that were left over from our flooring project to hold the pieces together. Tada! Hidden nails. The cut edges had a distinct fresh wood look that stood out against the rest of the box. While measuring and marking my cut lines earlier, I noticed that it was very difficult to see the pencil marks because they were almost the exact color as the weathering. This gave me an idea! I used a standard #2 pencil to color over the cut edges and hide the fact that they weren’t weathered like the rest of the box. It worked great! Finally, since I wanted to maintain the natural look of the wood, I didn’t want to stain it. So we finished it off with a few coats of matte clear coat. 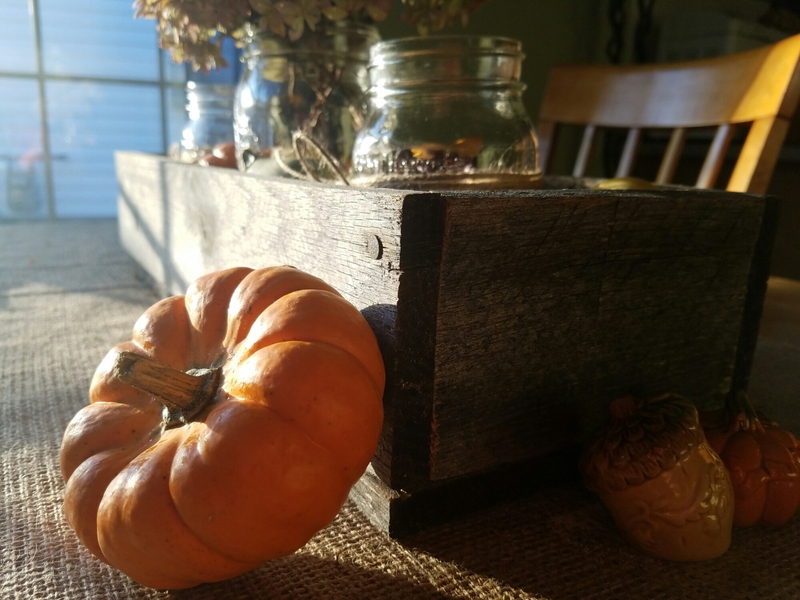 Add a few decorative pieces that scream fall, and tada! I love how it turned out. 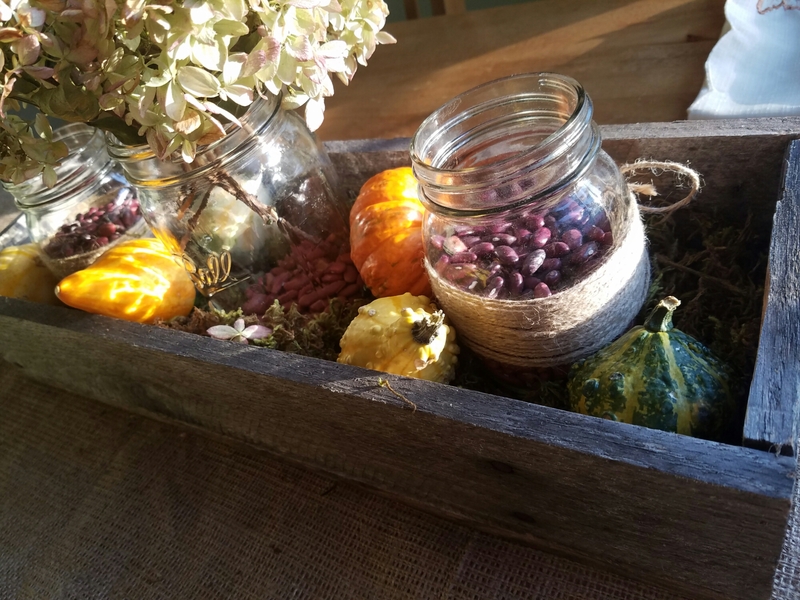 I lined the box with floral moss from Dollar Tree, then wrapped twine around some pint mason jars filled with red beans (there’s supposed to be tea lights in there…oops), dried hydrangeas from out front went in a quart mason jar, and finally, I added a few mini gourds. All of this is adorning a simple burlap table runner that I made for super cheap.